This is an 8"x 10" Relief Plaque of high fired bisque. Hand painted patina. Signed and dated by Artist Robert Toth for its collectible value. "And so my fellow Americans, ask not what your country can do for you - ask what you can do for your country. " The 35th President of the United States, elected in 1960. He became the youngest man (47) elected to the presidency, up till that time. He established the Peace Corps in 1961 and advocated civil rights reform. He forced Khrushchev to remove Soviet missiles from Cuba in 1962. 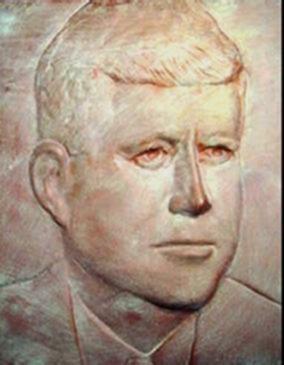 Kennedy was assassinated in Dallas, TX, on November 22,1963.